Energy ratings come in a number of different forms, and while they’re there to help us make sound decisions based on the long-term running costs and greenhouse gas emissions of the products we use, they can sometimes be misunderstood. Here, we give a low-down on labels, and how to get the best out of them. The Europe-wide energy label has been around since 1992, and it’s something the UK is likely to be sticking with in order for its companies to do business across the continent. Currently, appliances energy labels feature a scale that can go as high as A+++ and as low as G. As many products now hit the top end of the scale and there’s little differenatiation, it’s set to revert to a simple A-G format for some product types after 2021. More space is needed for innovation, so initially, nothing will be in the top categories and the most efficient fridge today, for example that’s currently A+++, will be rated C or D.
There are still some product categories where the current system provides clear differentiation, such as tumble dryers. Here, the worst performers can be found in the C category, while the best are heat pump models that can achieve an A+++ rating. For products such as dishwashers and fridges, where the options are clustered around the A-pluses, you can use sites like the Topten initiative to find the ‘best in class’ options. Topten initiative also provides information on what minimum energy rating you might expect to find for a certain category of product. Other information on the label to look out for is the kWh/year figure, as there can be quite a big difference between bigger and smaller models. Don’t buy a bigger product than you need: that’s just common sense – you don’t need to look at the label for that. Labelling, and a European Directive around Ecodesign, more broadly, has brought results. Ecodesign is an approach to designing a product which considers its environmental impact during its whole lifecycle. Ecodesign alone saves the average European household €332 a year, and that figure rises to €454 if they choose ‘best in class’ products. The repairability of products is also under consideration. EU member states recently voted that repair aspects, and ensuring the availability of spare parts, should be incorporated into Ecodesign regulations for fridges and freezers, with a final decision due in March. It’s all part of a push to boost the ‘circular economy’ and cut waste. Watch this space. Boilers and other forms of heating such as heat pumps got energy labels in 2015, and unlike those for appliances and gadgets, they won’t be switching format any time soon. Beyond an A++-G rating, the label includes information such as the level of sound they produce and for some product types whether the heater has the capacity to generate electricity – the latter accounting for the fact that the heating market is changing, with more low-carbon options. Recent Boiler Plus legislation in England means that now, a minimum level of energy efficiency is required from a heating system for it to be installed – the equivalent of an A rating. The new rules also mean that when a gas combination boiler is being installed, it must come with certain controls. The whole package then receives a rating, not just the boiler itself. Installers should be in the know when it comes to requirements and labelling, but as our guide to boiler replacement explains, you should always seek out multiple quotes, and make sure that professionals are registered with bodies that provide assurance that the work will be of high quality. Energy Performance Certificates, or EPCs, are legally required when buying or renting a home. They tell you how energy efficient the property is, from A (very efficient) to G (very inefficient). Most of the UK’s housing stock falls somewhere in between the two – meaning there’s generally room for improvement. The certificate gives an indication of how much the home will likely cost to run now, and how much could potentially be saved with some home improvements. These measures are detailed, as well as where the place will rank on the A-G scale after the work is done. 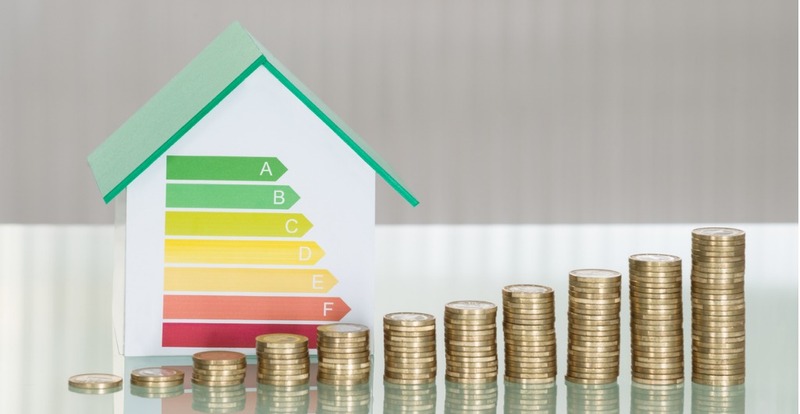 Other information you’ll get from your EPC includes a breakdown of how various elements of the building are performing, heat demand, as well as whether there’s any renewable sources contributing to the home’s energy supply. The possible savings from taking action on an EPC’s suggestions can be very significant. For a ballpark figure, getting a home from an ‘F’ to a ‘B’ could save in the region of £4,000 on energy bills over three years. Standards are also tightening on the calculations that lie behind EPCs. The Standard Assessment Procedure (SAP) is currently being updated to take better account of factors like the type of low energy lighting used in a property, what kind of shower is installed and how ‘green’ the electricity supply is compared to previous years. This should make EPCs a more accurate account of a home’s performance than ever before. Check our blog covering EPCs page by page, for the full run-through of what it all means. England and Wales under company number: 10172824 Call 01325 466016.